We drove into Cumbria after dark, just as the winds were picking up. Outside it was right on zero degrees, although the little weather app on my iPhone said, helpfully, “feels like -6”. It did. The journey had been almost twice as long as we’d anticipated, an unlucky accumulation of London traffic that had continued for three hours outside London; a sun that set at half-past-three in the afternoon, leaving us to navigate our oversized hire-car through steep and winding country roads after dark; and, speaking of navigation, numerous opportunities to take wrong turns and get lost, which we did (there were even road-signs saying “don’t trust the sat-nav”). From bed that night I could just see the soft, watery light of the crescent moon behind the still-gathering clouds, filtering and refracting through diamond-paned windows that had filtered and refracted moonlight into this room for 500 years, exaggerating the shadows of the beams in our ceiling. The wind was picking up, battering around the ancient walls of our gatehouse in a beautiful fury. The moon was long gone by morning, and the sun was doing its best job of hiding, too, but the grey dawn revealed bare trees and stone walls and crumbling ruins and bracken-covered hills as far as the eye could see. I ran outside in my slippers, hugging my pyjamas close, and drew in the wild view like oxygen. Naturally, there was a pretty village nearby, where one could find welcoming locals with musical accents and a cafe with cockle-warming, home-cooked meals. Also naturally, there was a castle ruin, a 900-year-old edifice on an ancient mound that was once settled by Danes and was still part of Scotland until a thousand years ago or so. I climbed the hill to the ruins alone, while the rest of my family went to find somewhere to buy groceries. The promised “ice rain” had begun, and I have honestly never felt as cold as I did atop that wild and windswept hill, not even on the January night I walked home beside the Hudson River in New York with my friend, and we learned later that it had been -18 degrees. It was the wind. The wind that burned my ears with cold like razors, stung my eyes with dry tears, tipped me sideways, and genuinely sucked the breath from my lungs whenever I faced into it. Literally breathtaking. How is it that this world is so full of so many beautiful places? How can we bear it, in our hearts? 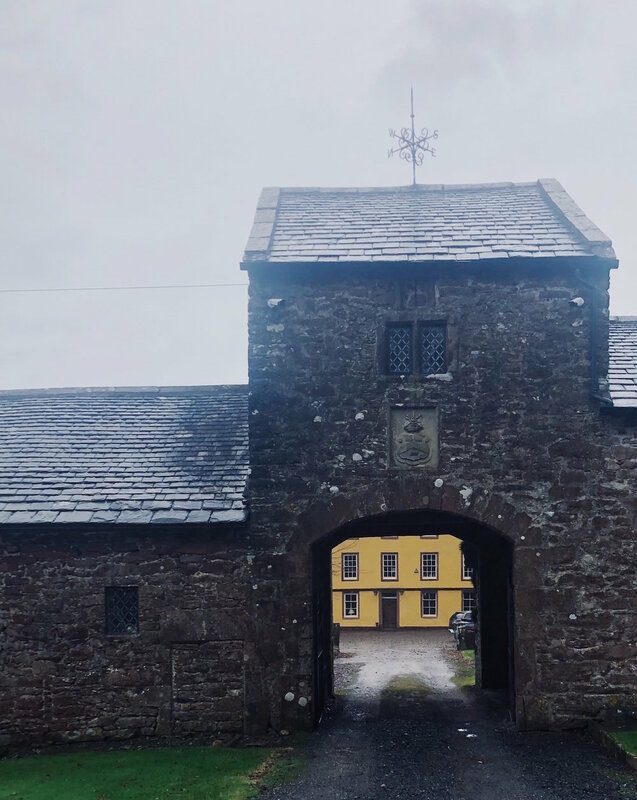 We only stayed in this ancient gatehouse, perched on the edge of lovely emptiness, for two nights, but I cried for the beauty of it all three times. I didn’t want to leave. But then, that’s also how I’d felt when first we climbed the steep, cobblestoned streets of Dinan, when we made our picnic under the trees at the castle ruins of Lehon, when we lay down in sunshine among fields of wildflowers in the grounds of Hever Castle, and when we lost ourselves inside the ancient, golden-hued forest of Broceliande. I know I’ve talked about this on my blog before, the twin concepts of home and belonging. When I married my husband, we made the song Home is wherever I’m with you by Edward Sharpe and the Magnetic Zeroes the unofficial theme-song of our marriage, a testament to where we’d been and where we were going, after I’d left New York to live with him. Every time we moved to a new city, I sought out ways to make it feel like home. I enrolled in a Master’s Degree when we moved to Queensland. I planted a garden when we moved to Sydney. I volunteered when we moved to Adelaide. When we moved to Melbourne, I was already pregnant with my daughter, so new mothers became my community. I don’t quite know when I started growing restless again. Partly, I think it had to do with having children. The day you hold that new baby in your arms, your world instantly unfolds like a meadow of night-blooming cereus: dazzling flowers, hypnotically-scented, and all opening en masse in one, magic night. But parenthood can also draw your world inside (like the night-blooming cereus closing at dawn, maybe? ), and even if you don’t have kids, you’ve heard enough stories from friends and siblings and aunties and grandparents… or read enough mummy-blogs… that you don’t need me to talk about that odd and disorienting and beautiful and isolating parenthood bubble right now. My point is that becoming a mother, while undeniably the best decision I ever made and the best thing I will ever do, also taught me to see my home-town in a different way. The exciting cafes and galleries and festivals and street-art and food trucks and pop-up events that once helped me fall in love with my city became, almost overnight, all-but lost to me, sitting at home with sleeping (or not-sleeping) babies while my husband worked 100 hours a week. I have watched the world go on without me, from the distance of the Internet. And when you take away all the wonderful things about life in the city, you start to notice the restrictive things. The lack of fresh air, open spaces, and trees. The reliance on other things (shops, cars, telephones) for even the most basic necessities of life. With a fidgeting toddler in one arm and a hungry baby in the other, the world feels as though it doesn’t belong to you any more, and for those of us used to being “in control” in the workplace, this new workplace feels about as out of control as workplaces come. So, as I stood alone on that ancient hilltop in the breath-stealing wind, these were some of the thoughts that were going through my mind. I wanted to live in this place more than I’d wanted to live anywhere, ever. I sort-of cried, again, but I didn’t truly cry, because the wind stung my eyes and dried my tears before they could fall. We won’t be moving to Cumbria any time soon, no matter how badly I want it. And the truth is that even more than I want that open-fielded life, I want to stay with the people who fill my life right now. They are my home, wherever I go (Home is wherever I’m with you). After I climbed down from the castle ruins, I found my family in a little second-hand shop on the high street, deep in conversation with three locals who had each lived in this village and known one another for eight decades, or more. They recommended the fish and chips shop for lunch and, an hour or so later when we bustled in from the rain and found somewhere to sit, our new friends were already ensconced around a table at the back. As we left, my husband secretly paid for their lunch and another round of their coffees, and it’s times like this that I remember why I first made him my home.